There’s just something about having men in the house that makes it smell more… musty and I’m not talking about just the bathroom or bedroom. The mustiness spreads to the whole house and is there to welcome you when you get back from the grocery store; it’s a problem. I find the mustiness to be especially bad when I leave for vacation. 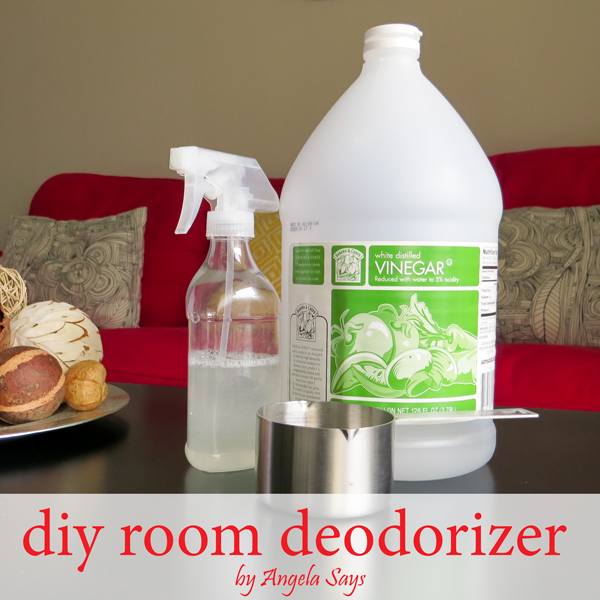 The easiest way I’ve found to combat the musty smell is my easy DIY Room Deodorizer spray. That’s it! Now the amount of water and vinegar you need will depend on your level of teenage mustiness. On a scale of freshly showered to high school locker room, we usually linger around the “freshly showered” and laundry day is “gym day.” I typically use 25-40% vinegar to water since I also use the solution to clean and it works well, even on tough odors. My house was having a particularly bad day with mustiness, due to the fact I was sorting dirty laundry in the living room and I sprayed some of my homemade room deodorizer. Within minutes, the room was fresher; if you closed your eyes, you wouldn’t know there was dirty laundry in there. A great thing about this natural deodorizer is that it’s inexpensive and you can make it to fit your needs. I mentioned previously that I typically use a mild to moderate solution but if the smell is high school locker room, I’ll just use straight vinegar. I love using this homemade room spray instead of the commercial stuff because I don’t have to worry about breathing in harmful chemicals, or what kind of residue it may leave on surfaces. The vinegar works well to kill the odors instead of mask the problem. You can use this spray in the air, on the couch, or even on clothes. Yes, there is a vinegar smell, because you’re spraying vinegar, but it does dissipate quickly. You can scent your vinegar as I did with citrus to cover the smell. Quick frankly I’m used to the vinegar smell and it doesn’t bother me anymore since it dissipates so quickly. Although, I joke that I live in a pickle factory. What’s your favorite scent for your home? Thanks for the tip! I didn’t think to use it as a deodorizer and I totally understand the smelly boy smell. I use vinegar and water for cleaning everything as well, I pick up the huge bottles of vinegar at Costco. Love your posts! You’re welcome! I get my big bottles of vinegar at Sam’s Club and love that they last me a while. Thanks so much for stopping by! have used this before, although not mixed with water. Since I have severe allergies, this is essential for me — have breathing problems when I spray anything that is aerosol. I’m glad I’m not the only one who uses this! I always worry about what I’m breathing in with the aerosols. I will give this a try. I hadn’t heard of using vinegar as a room freshner. I really love it because it’s cheap, easy, and kills odors instead of masking them. Hi Angela, I love vinegar and water for cleaning so this totalky makes sense!! Going to try it! Started following you on Pinterest! Thanks Selene! I’ve also found that it also deodorizes while cleaning so I don’t always have to pull it out for deodorizing. Kindred spirits, Angela. I use vinegar all the time as well. I boil it on the stove to remove cooking odors, leave bowls of it out to neutralize smoke when we have had guests, clean with it, and add it to the water in my steamer and steam iron, just to mention a few. I have used it straight as a room spray a few times, but will try your “recipe”. We sell vintage items on ebay and always have something around that needs “freshening”. Thanks a bunch~~you are so very helpful, as usual! I like the watered down version because the smell goes away faster and it still works as well as full strength. I’m so glad I can help give you ideas. Thanks so much for stopping by Lillace! Thanks for the tip! I’ve also read other versions of this that contain baking soda – this is even easier! You’re welcome! I’ve tried baking soda mixed with liquids in a spray bottle but it always clogged up and therefore have not liked them. This recipe works just as well without clogging up the sprayer. 🙂 Thanks for stopping by Deanna! You’re welcome! I really love the versatility of vinegar which is why I write about it so often. 🙂 Thanks so much for visiting! Thx for the great tip. Can this be used on all surfaces? Yes, but be careful if you’re spraying near fabric that doesn’t like water. Dear Angela: There are a two cigarette smokers living in a small 2 bedroom apartment. The smoke smell has permeated everything and is likely offensive to their non-smoking guests. They use an expensive Honeywell air purifier when they sleep or leave the house; which helps somewhat, but not completely. Please advise me on how to best to tackle this smelly dilemma on an ongoing daily basis. PS: There is no deck or patio, and the tenants don’t want to smoke outside. Per their lease, opening a window is not allowed when the outdoor temp is below 50 degrees, which in Minnesota is Dec.- March. Thank you in advance for your help with this problem. Merry Christmas! I have a few suggestions but cigarette smoke is difficult to remove completely. My first suggestion is to have them deep clean everything, walls, furniture, carpets, ceilings and change the HVAC filters. My next suggestion is try to limit the smoking to one area, like the bathroom or kitchen since these areas should have exhaust fans to carry the smoke out of the house; have them turn on the exhaust fan while smoking. In addition to vinegar as a room spray, they can leave little bowls of it out or activated charcoal. Doing all of this will not get rid of the smell completely but it should help reduce the smell. If the tenants keep up with cleaning the carpets and furniture regularly, then that should also help with the smell. I also think that if they run the air purifier while they smoke should help, especially if they are near it. I also found some great information here and here. I hope this helps, good luck! Oh no, you had me until you mentioned pickles! I loathe pickles and the smell of them too. I think I’ll still try this however, since a straight vinegar smell is isn’t quite the same. Yes, the smell is a little different but I promise the smell disappears quickly! Less than a minute and the smell is gone. can you add essential oils to make it smell better as a faster alternative to the citrus vinegar? Yes, I’ve heard of people adding the oils to cover the vinegar smell. How can you remove scratches from Stainless Steel Fridge?